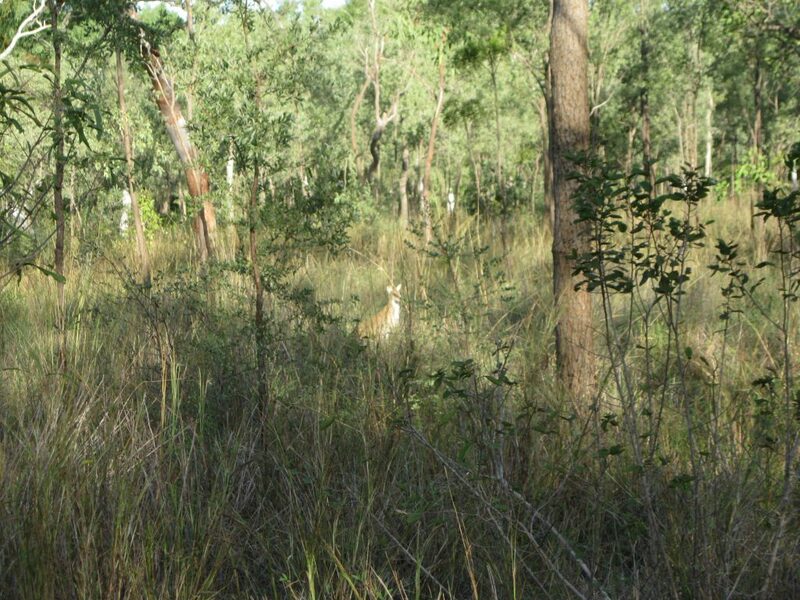 The park is located close to the very stunning Limmen National Park in the Gulf of Carpentaria. 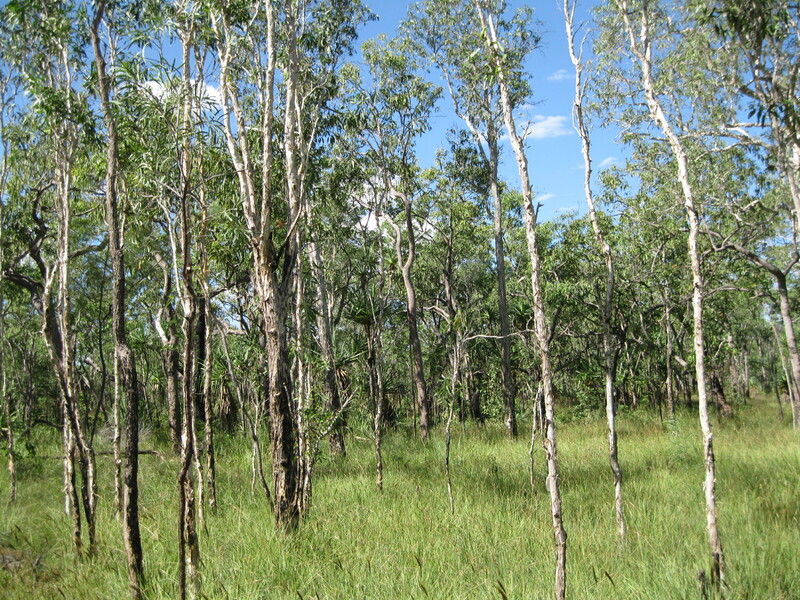 This is a very isolated part of Australia in the north eastern part of Northern Territory. Until recently big parts of this land was not visited or explored by the white man. You have the option of camping at Lorella Springs when visiting Limmen National Park. It’s a good option as you can easily spend 2-3 days to explore both parks. Driving from the Lorella Springs camping area to the Southern Lost City in Limmen National Park will take you about an hour. The park is privately operated and family owned. 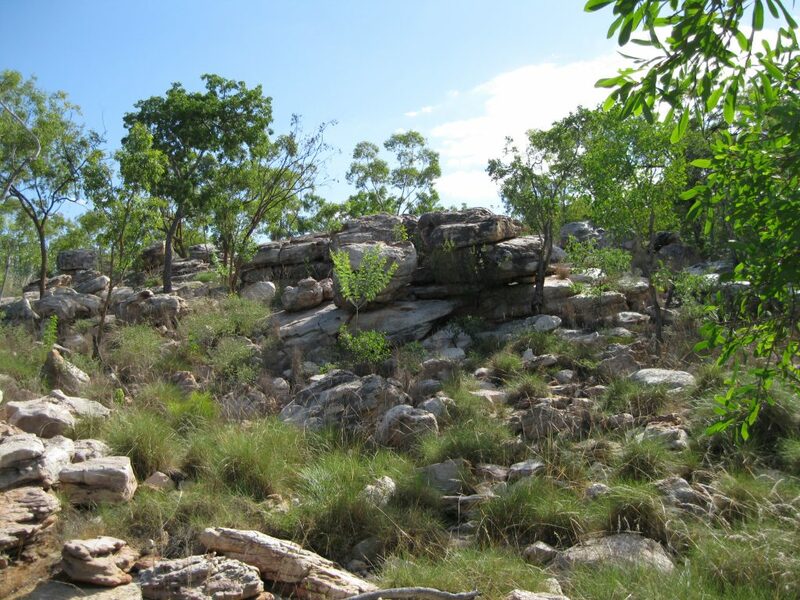 It is usually accessible during dry season for high clearance off-road 4 WD vehicles suitable for the Outback. The best time to visit is between April and to the end of October. Bear in mind that the road conditions can vary on the time of your visit. Just after the wet season and the first couple of weeks after the park has opened in April, it will be a bit muddy and you should expect water crossings. The property is huge. It is 4,000 square kilometres (1,544 square miles) which is five times as big in size as New York City. 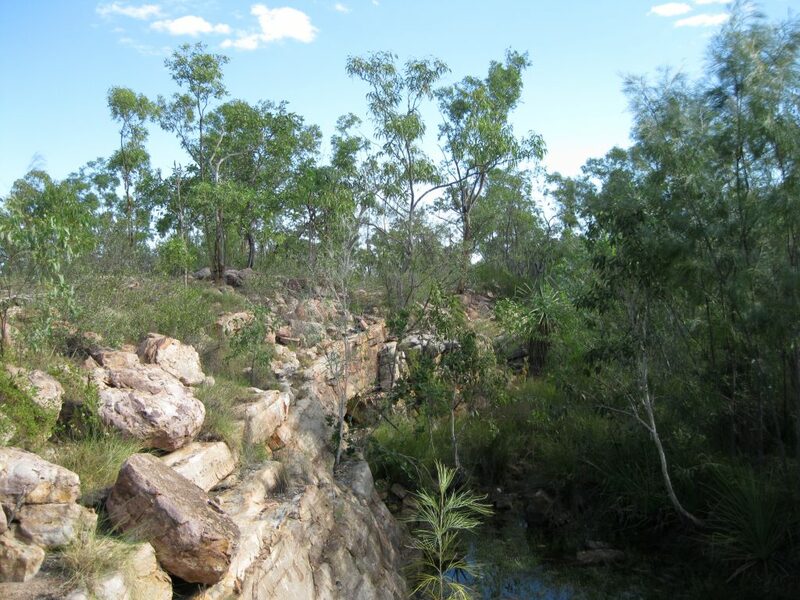 It’s surrounded by Limmen National Park, Aboriginal land and a huge stretch of untouched coastline of Gulf of Carpentaria with rivers and waterways. Lorella Springs Station is located 29 km (18 miles) north of the Savannah Way and to give you an idea of the remoteness, the distance to closest community of Cape Crawford is 130 km (81 miles). The park has a vast scenery of savannah, to coastal flood plains, salt flats, mangroves, forest and a rocky formations. 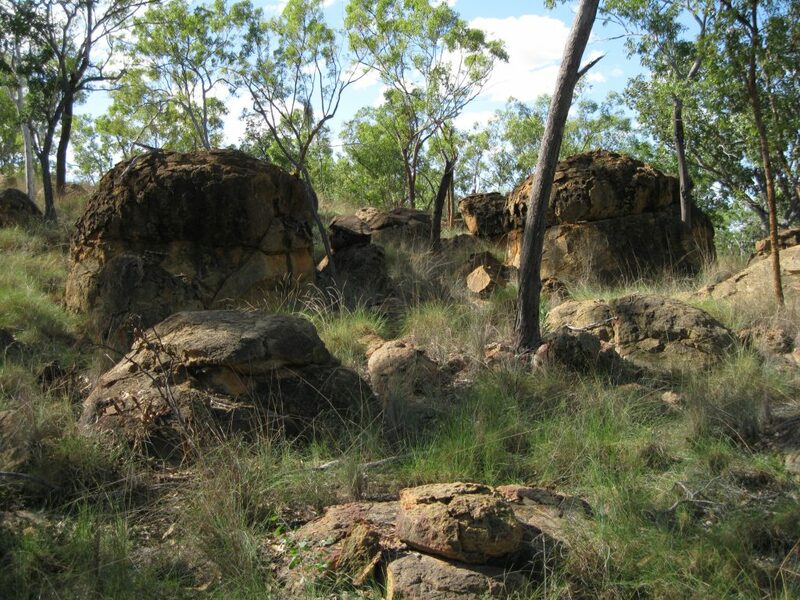 It features a plentiful wildlife, historical sites, Aboriginal culture, caves, chasms and ancient fossils. 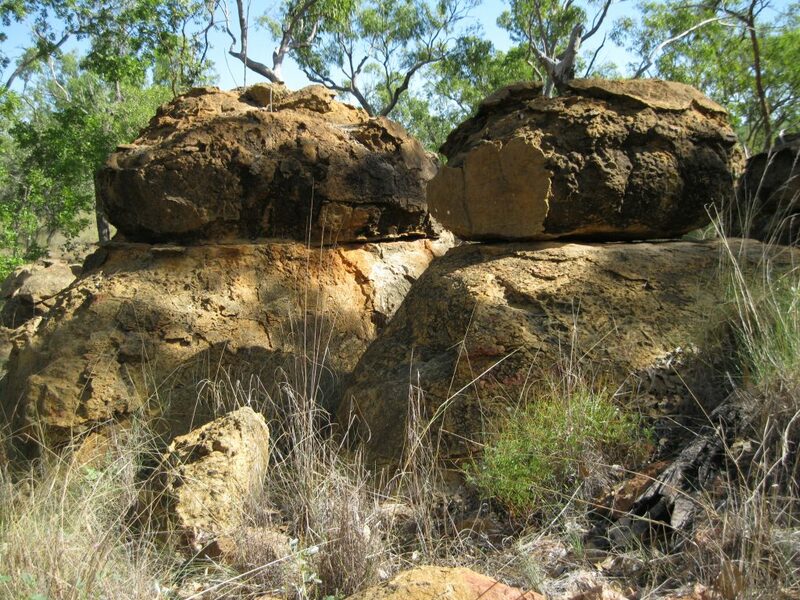 It is also known for having a lot of mineral riches such as gold and diamond. The property is mostly used for tourism with the majority of traffic entering through the main gates. A few people fly in and land on the airstrip of the park. A small part of Lorella still operates as a cattle station where they harvest wild cattle. The camping site is based at the homestead campground which is also where the Lorella Thermal Springs are located. Due to the vast area of the park, the campground is quite extensive. At the entrance you will find a reception area which is extended into a bar. Pretty neat concept. There are bathrooms with flush toilets and showers, and also taps for drinking water around the site as well. To the right of the bathroom area there is a little bird sanctuary with roosters, chickens, a peacock and an emu. They will be strolling around that area and into the campground which is quite cosy. The homestead campground is a nice spot. The site stretches for one km (0.6 miles) on grassy grounds with plenty of space for tents, swags and various vehicles. After your arrival and check in, you can park your vehicle and set up our tent and chill out a bit in the sun. It’s a quiet and peaceful place in general during the day and in the evening. On the down side you will be woken very early in the morning by the aforementioned rooster which is actually quite annoying as it starts very early. But while visiting you will have to deal with it. So you may as well start your day when it awakes you. If you have any questions about the park or if you want to do scenic flights of Lorella Springs and Limmen National Park, query this with the reception area right next to the bar where you can get assistance. The bar is a cosy place to chill out as well. Just bear in mind that drinks are expensive so can bring your soft drinks or alcohol in your vehicle but you can just enjoy it in the camping area. You also have the choice of accommodation such as standard bedrooms with ceiling fans, large safari tents or air conditioned and self-contained cabins if you prefer a more luxurious stay. But to get the proper Outback experience you have to camp in a tent or sleep under the stars in a swag. Right behind the bar and reception, the hot springs, also known as the Lorella Thermal Springs are based. You should definitely go here for a dip. It is nice especially after a long days hike in the scorching hot sun. Absolutely pure joy and relaxation. It’s also so good on your feet if they are a bit sore. You may also meet some other travellers here and get their story on why they are passing through. It’s always great to hear about people’s travels and experiences. People will have the most remarkable stories as Lorella Springs is quite the unusual destination to visit. When you get to these very remote areas of this beautiful land you will meet a lot of Australians from all over the country but also some people from overseas. It will be people from all walks of life which is such an enriching experience. There has actually been identified eighty natural springs on the property which are said to flow through the subterranean waterways from New Guinea to the Gulf of Carpentaria. This makes the park a great place to swim, not only for the springs but also the waterfalls and the plunge pools. If you are into fishing, there are opportunities for freshwater fishing within the proximity of the homestead. 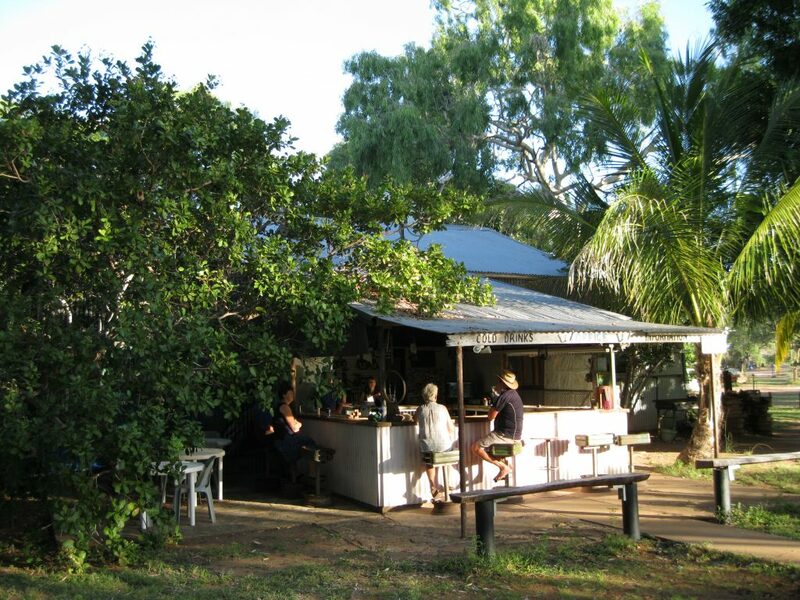 It is one of the few place in the gulf area of the Northern Territory that allows you to access the remote coast by car. To protect the unique environment and ecosystem the park has a strict catch and release fishing policy. No hunting is allowed and all flora and fauna are protected. Lorella Springs Wilderness Park has a vast road and trail system that provides you with plenty of opportunities to explore the wonderful scenery. As you head onto the tracks you will note that the road signs and maps are quite primitive and not up to the standard of a national park. They are clear and understandable though but bear in mind that the scale is a bit off as the signs are hand written. It does give it a touch of being in the wilderness area though. If you go sightseeing by 4WD, make sure you drive carefully on these dirt roads. You can also go canoeing, have a stroll along the beach or even climb the Tawallah Range and check out the views form the ridge. You can go camping in the more remote areas of the park, pretty much anywhere on the property. Just remember to bring your rubbish with you when you leave and be careful with campfires. Do not camp to close to rivers or beaches due to the danger of estuarine (saltwater) crocodiles. Note that there won’t be any bathroom facilities in these areas. Remember to fill in the “sign out” form of the property so they will know where you are going and when they can expect you back again. If you are staying at the campground and you feel like exploring some of the sights within the proximity of your temporary home in the park, you could check out Crocodile Springs. This can be done by foot which is a return walk of approximately 4 km (2.5 miles). You have to head out of the campground and make a right turn onto the 4WD track. You will be hiking on a sandy level track which is not strenuous. The biggest concern is the sun baking down on you as you will be pretty exposed. After a bit of a hike you will get to a crossroad at the end of the road. There’s a tree with a sign directing you to the left towards Crocodile Springs. You will continue down a similar sandy track along a creek all the way. 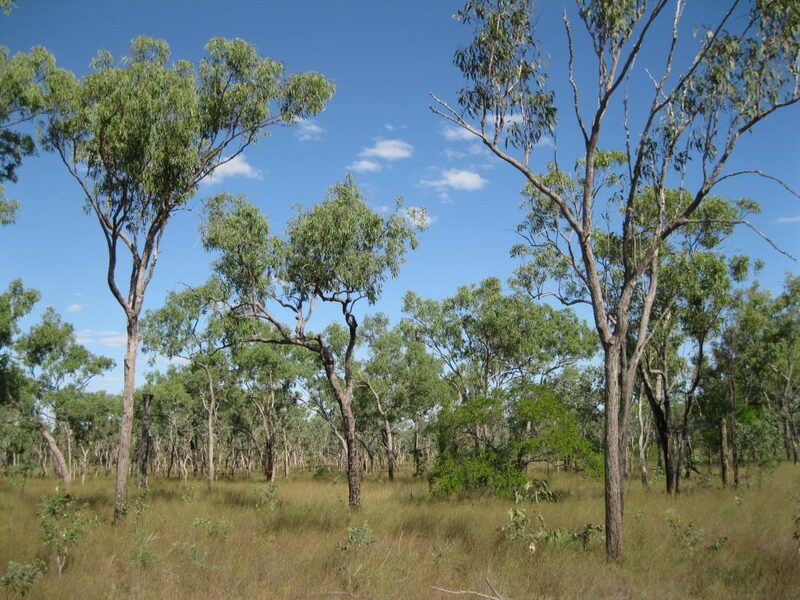 It’s a really beautiful sight of gum trees and other vegetation both along the creek to the right and on the savannah plain to the left. Just before turning down to Crocodile Springs there will and an awesome eroded crack with the tree roots exposed in the savannah plain created after the floods of the wet season. This scenery will change from year to year though, so when you’re there it may be different. 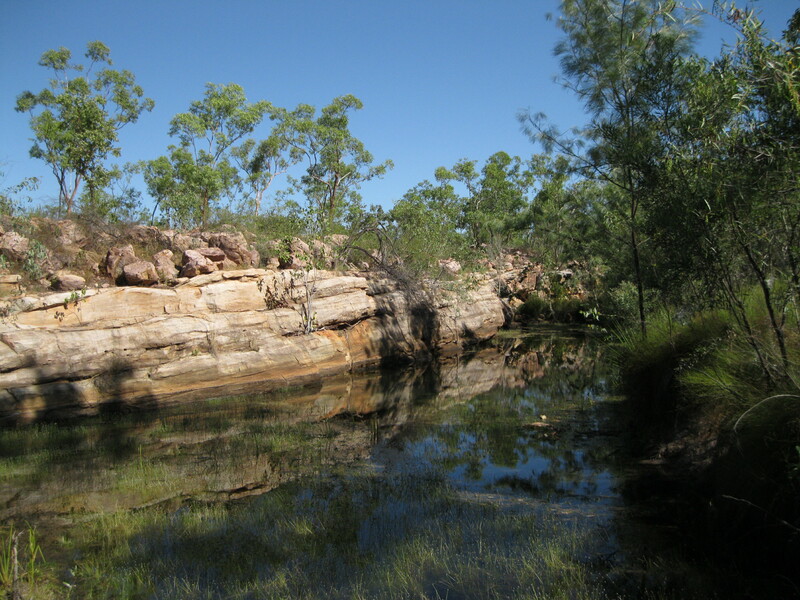 The track will eventually lead down to a beautiful billabong and you have arrived at Crocodile Springs. This is just the essence of pure wilderness and the bush. 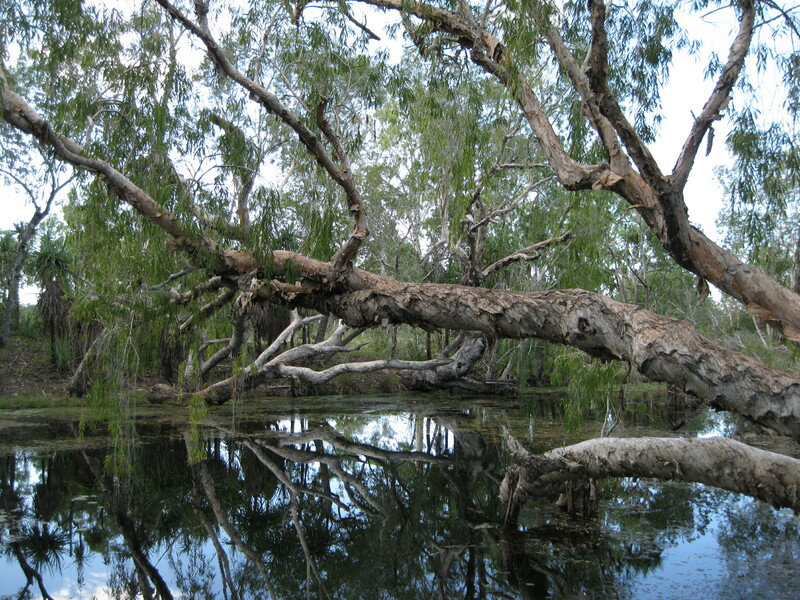 Chill out here for a while and treasure the solitude of this majestic waterhole with massive gumtrees hanging across reflecting in the pond. An awesome photo opportunity. Afterwards you can choose to make you way to the campground which will be via the same track. Keep your eye out for wildlife as you may just spot some magnificent birds. Another cool hike you could do from the campground is to Inkspot Pool via the Scenic Tawallah road, and further down towards Chicken Run and down the Tawallah Track. As you leave the campground, turn right and head all the way down the same road which leads to Crocodile Springs. When you get to the crossroad, you continue straight ahead towards the Tawallah Track. Bear in mind that the road is also used by cars so pay attention if cars are in the area. You will get to a creek which you will have to cross to get to the other side. This spot is known as Grovesy’s Grief. It really depends on when you are visiting but the creek will most likely be waist deep. So you have to change from pants and hiking boots or shoes to bathers and an additional pair of shoes you don’t mind getting wet. It could be sandals. It has to be foot wear strapped firmly around your foot so they don’t fall off in the creek. Therefore thongs won’t be appropriate. Strap your hiking boots or shoes onto your backpack so they are ready for the crossing. When you have crossed, put your pants and dry foot wear on again and mosey down the Scenic Tawallah dirt road. You will be travelling through savannah landscape with rock outcrops and waterholes. Quite interesting scenery. Bear in mind you will be really exposed in the sun so remember to drink plenty of water, apply sunscreen and wear a hat. 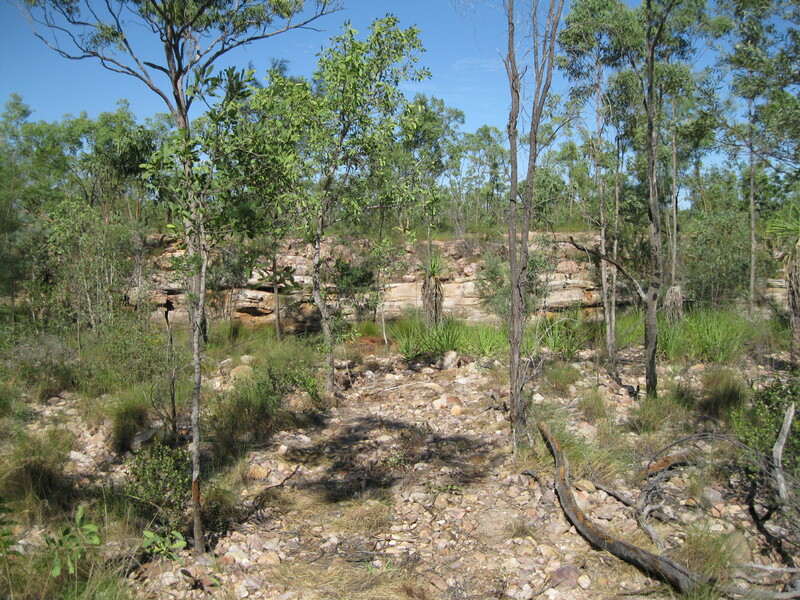 After about 2 km (1.25 miles) you will get to a primitive rugged track on your right that leads down to Inkspot Pool. Head down the track and before you is a beautiful little pool with a small but awesome multi-layered rock wall as the backdrop right in the middle of nowhere. This is the real Outback experience. Take some shots and feel the serenity of the place. Head back to the Scenic Tawallah dirt road and continue further up the road where you will begin to see small slopes of exposed rocks, more savannah scenery and smalls creeks. As you turn right towards a road called Chicken Run you will arrive at an area of red rocky outcrops as you head up the Tawallah Track. They are quite stunning and fascinating to study up close. After spending some time exploring you can head on back to the campground via the Tawallah Track. As you are passing savannah landscape on one side and rocky slopes to the other you will get to a point with a sign to Inkspot Pool which is the access to the waterhole from the other side. As you meander your way across the rocks down towards the pool you will arrive on top of the aforementioned rock wall of the pool. You can get some awesome shots of the rock wall and the pool from this angle. It’s a terrain of pretty wild vegetation. Really amazing. 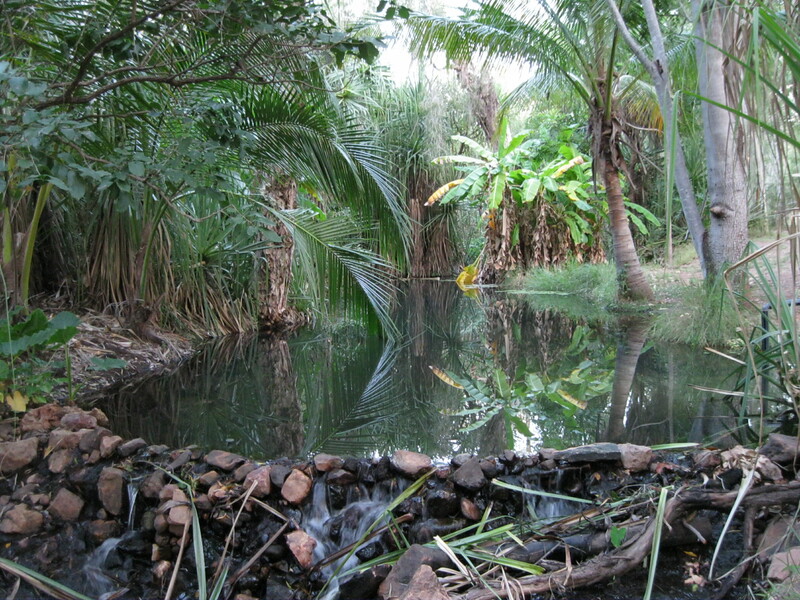 At the end of the pool there is a small rock dam as well. Quite a primitive and simple structure. As you continue heading back to the campground you will continue through more savannah until you reach the creek crossing again. It will be the same exercise as before, take the pants and boots or shoes off, put the bathers and the additional shoes on and cross the creek. When you have cross you have final stretch to the campground to complete. Keep your eye out for wildlife. 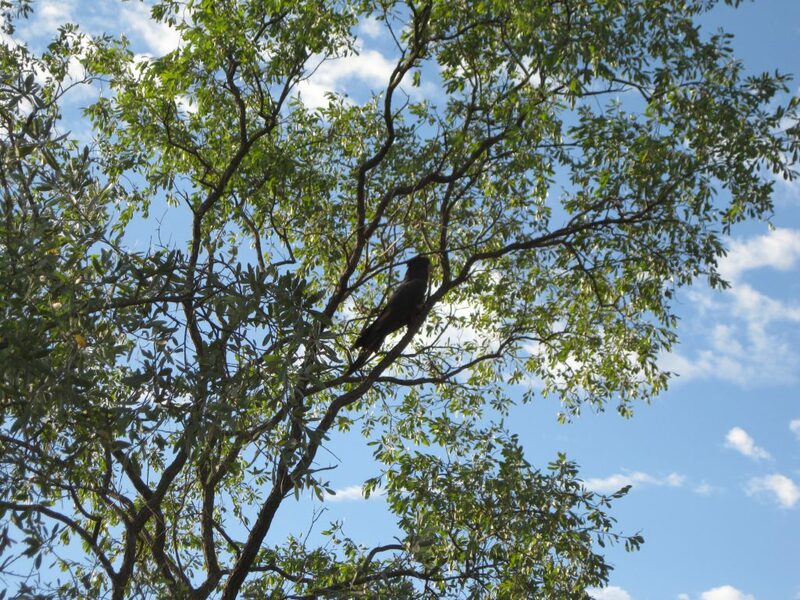 You may just spot some beautiful birds such as the red-trailed black cockatoo or a pretty-faced wallaby.